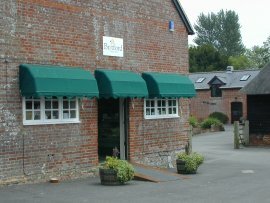 The Britford Farm Shop is based on Bridge Farm, in the beautiful village of Britford, near Salisbury (within sight of Salisbury Cathedral and the A338). The Britford Farm Shop aims to promote the best in locally produced, locally sourced food and drink. Much of our produce is organic, GM-free, diet-conscious (for allergy sufferers) and ethically produced. We believe in the merit of 'Slow Food' production (the opposite to Fast Food) and as a consequence many of our products are traditionally made and seasonal. The shop opened in 2004 and has won finalist in Best New Business of the Year 2005, in the Federation of Small Business Annual Awards and been given a 'Silver Award 2005' by Taste of the West in the Local Retail Outlet category for Wiltshire! We offer free deliveries and organic vegetable-boxes when you spend ten pounds or more and live within a six mile radius. Our horse-drawn delivery service, to local villages, will be available soon!